Fortress finished 2012 with $53.4 billion (B) of Assets under Management (AUM) – up 22% yoy, and obviously well ahead of an average $48.6 B of AUM for the year. Full year management fees were $479 million (M), while incentive fees contributed another $278 M – or 0.99% & 0.57% of average AUM, respectively. 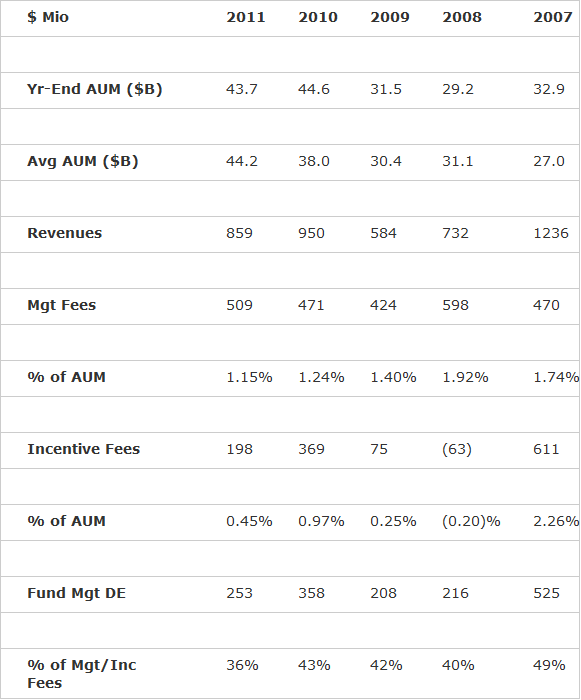 The decline in management fees (as a % of AUM) isn’t a cause for concern – it’s simply a by-product of the continued fund-raising success of Fortress’ traditional fixed-income unit (Logan Circle Partners). [Which obviously charges a far lower fee rate, plus it currently operates at break-even. We’ll price accordingly, but note the 2010 acquisition of Logan’s been a resounding success – AUM has doubled since to $23.6 B as of end-Sep]. Incentive fees have continued to rise (on average, from their 2007 nadir), driven by an acceleration in private equity realizations. And finally, fund management distributable earnings (DE) of $277 M – which approximates operating profit – delivered a 37% operating margin. Well, we should obviously first mention performance itself – Fortress actually has a great story to tell this year: Their private equity & hedge funds have delivered strong double-digit returns YTD. Credit Opportunities Fund & Credit Opportunities Fund II have delivered net IRRs since inception of 25.9% & 18.4%, respectively. And all 16 of Logan’s fixed income strategies have outperformed their benchmarks since inception. The company & its funds have also garnered numerous awards this year. More importantly, multiple funds are now in a position to deliver current & future incentive fees – in fact, Fortress now has $807 M of gross embedded incentive income that hasn’t yet been recognized in DE. Next, let’s examine Fortress’ focus on 3 major investment themes in its PE funds (& credit funds, to some extent): i) Financial Services/Mortgage Servicing, ii) Transportation & Infrastructure, and iii) Senior Living & Care. You’ll notice each theme offers attractive scalability, consolidation & growth opportunities. In my opinion, this grants a compelling edge to FIG & its investors in terms of risk/reward (vs. its peer group). [For example, Fortress funds appear to rely on/require far less leverage than (say) KKR & Co (KKR:US) or Blackstone Group (BX:US) to deliver attractive returns, particularly on a risk-adjusted basis. I suspect underlying LBO risk is often under-appreciated by investors when evaluating certain alternative asset managers]. Newcastle Investment Corp (NCT:US) has been listed for many years now, while Nationstar Mortgage Holdings (NSM:US) IPOed last year. In May this year, NCT spun-off New Residential Investment Corp (NRZ:US). And since then, NCT’s announced another plan to spin-off of its media assets into New Media Investment Group, a deal to be completed in early 2014. Fortress also hinted at a spin-off of NCT’s senior housing assets. [Which would nicely complement another portfolio holding: Brookdale Senior Living (BKD:US)]. Their latest success is the IPO of Springleaf Holdings (LEAF:US) – at the current share price, they’re looking at a 13x multiple of invested capital in just under 3 years! I suspect we’ll see something similar to come with transportation & infrastructure, in due course. Fortress already intends to list a new investment vehicle, Worldwide Transport & Infrastructure. And it has very interesting plans lined up for its assets in Florida (see Q&A). Despite the European (& Asian) models we already see, infrastructure remains a huge & relatively untapped investment opportunity in the US. But with the federal & state budgets already stretched to pay for current spending, debt & pension/health entitlements, this dam will inevitably burst (they need to repair those too). New & required capital spending on infrastructure will inevitably demand massive private, or public-private, investment. And just in the last week, we see Penn National Gaming (PENN:US) spin-off what I believe is the first casino REIT: Gaming & Leisure Properties (GLPI:US). This was a highly original & attractive unlocking of value for shareholders – p. 10 of the linked presentation nicely illustrates it. Finally, let’s also remember Fortress has considerable exposure to German residential & commercial property, via Gagfah (GFJ:GR) & Eurocastle Investment (ECT:NA). Both vehicles have recently been re-capitalized and/or re-financed, setting them up nicely to participate more actively in the German market (take a look at my German residential series). Fortress’ emphasis on permanent investment vehicles should be highlighted here – it’s a very deliberate strategy, and welcome reassurance of revenue & earnings stability. After the Springleaf IPO, nearly half the NAV of their PE funds is now invested in public companies. This stands in marked contrast to most alternative asset managers who are generally in divestment mode once a portfolio company IPOs. It’s also testament to the potential investment opportunities & returns they expect from these listed companies. [We see the same alignment in Fortress itself – insiders still own 52% of the company. Plus Nomura Holdings (NMR:US) owns a long-term 12% holding]. Finally, let’s cover a couple of exciting new investment strategies that Fortress is currently/potentially pursuing: In April, Logan hired David Shell away from GSAM, where he was Co-CIO of the growth equities investment team & responsible for $20 B of AUM. It will obviously take time to begin delivering results (& AUM), but he’s essentially tasked with re-building his previous operation. To date, he’s hired a team of four ex-Goldman colleagues, and Fortress have now seeded four distinct equity strategies. Speaking of seeding, there was an intriguing article on Bloomberg this week, which says Fortress is considering seeding a spin-off of a new hedge fund firm. This would be headed by Adam Levinson, who’s currently CIO of their Singapore hedge fund unit. We’ll have to see what comes of this, if anything, but it’s potentially a great introduction to an exciting new seeding strategy. [I’ve already highlighted Tetragon Financial Group (TFG:NA) is now pursuing such a strategy]. The other obvious trillion dollar opportunity for Fortress, and every other alternative manager, is in European distressed assets. Pete Briger, Head of Credit, is refreshingly honest about prospects for the credit markets & his AUM – he acknowledges huge potential in Europe, but still hasn’t found much in the way of compelling opportunities. This appears to be caused by a combination of unrealistic sellers & unsuitable opportunities. The problem for Fortress is they generally like situations with a bit of hair on them, but which also offer good long-term growth & consolidation opportunities. But to date, a real estate and/or liquidation mindset is required to buy what’s actually on offer… However, I’m confident Europe will ultimately prove a large-scale & rewarding investment destination for Fortress – I suspect via the purchase of distressed companies, rather than portfolios of distressed properties/loans. – Dry powder is committed but uncalled capital, which most alternative managers include in their reported AUM (even though it usually doesn’t generate fees). 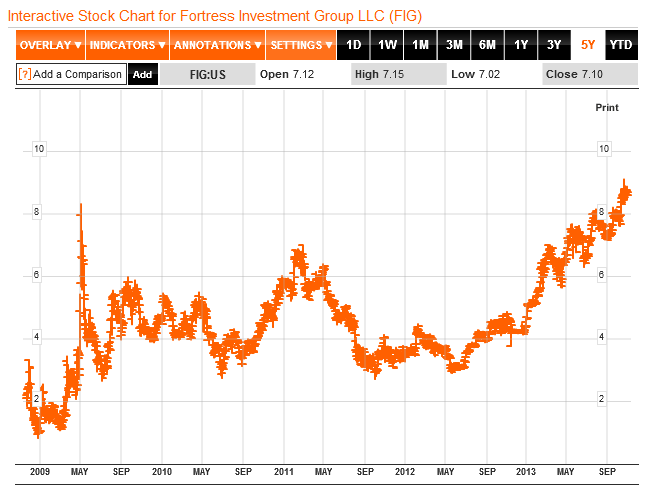 Fortress specifically excludes it – my valuation incorporates none of the firm’s $7.2 B of dry powder. – As I mentioned before, Fortress currently has $807 M of gross embedded incentive income in its funds, which hasn’t yet been recognized in DE. I also haven’t included $100 M of option value (related to Newcastle, etc.) in my cash & investments – this should be realized as incentive income/cash in due course. – Results continue to be impacted by Logan, which has sacrificed margins to date in pursuit of AUM. Ideally, with continued AUM growth, increasing economies of scale, and a decent contribution from their new equity strategies, we can hope to see a significant improvement in Logan’s fee rates & margins within a reasonable time-scale. – FIG’s annual dividend rate is now $0.24, a still attractive 2.9% yield – and we can reasonably expect a step-up to (at least) a $0.28 dividend & a 3.5% yield next year. But annualized pre-tax DE’s now running ’round $0.85, and FIG paid out over 100% of DE last year (in dividends & share repurchase). If we assume (say) 50% of incremental DE gets paid out as a top-up dividend, that amounts to nearly $0.55 in total dividends & a 6.7% yield for FY-2013! Share repurchase would also present a strong signal/incentive for both new & existing investors. Management’s repeatedly affirmed its commitment to returning a significant portion of annual earnings & slimming down the balance sheet. – My valuation approach pegs the asset management business at 5.95% of AUM, on an ex-cash basis. Over time, the asset management industry has established some well-defined market/M&A multiples. On average, a high quality fixed income manager might attract a 0.67%-1.0% of AUM valuation, while an alternative asset manager might command 7.5%-10% of AUM (or even higher). Relying on these metrics, one can quickly arrive at a very similar valuation for Fortress’ business. My $10.27 Fair Value per share offers an additional Upside Potential of 26%. I currently have a 5.4% portfolio holding allocated to FIG. Thank you, Stephen – now we just need the $FIG share price to agree & embark on a fresh leg higher..! Yes…unfortunately pretty much everybody ended up in the same boat! And it must be remembered, once Fortress listed these entities, shareholders actually expected that kind of (pre-crisis) leverage & hubris at the time – so there’s plenty of blame to go ’round. Now, with the fullness of time, there’s perhaps a bit of a silver lining – we can focus on the top-tier survivors & thrivers during/since the crisis (and FIG’s clearly one of them), and hope they’ve taken some v obvious/important lessons to heart (permanently!). Yes, keeping track of fund performance adds some useful granularity (as an aside, it’s especially useful with a small manager like ARGO:LN). Quite honestly, the only real attention I pay to quarterly earnings (because of the variability) is to provide some guidance about the scale of annual shareholder distributions (regular & special dividends, plus share buybacks). I think the above approach of tracking the current run-rate for FIG’s management fee rate, plus an averaging of its incentive fee rate, is a pretty reasonable compromise & provides a more appropriate medium-term perspective. Fortunately, we’re at a point in the cycle where this approach may prove somewhat conservative!